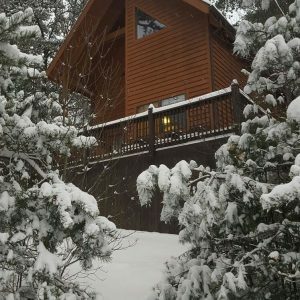 What a wonderful cabin, the perfect location, yet tucked away, yet close to everything. It’s now our 4th years in a row here. It feels like home to us. We are so comfortable here. We think we have seen the same bear eating berries in your yard four years in a row now. You have kept this cabin so clean and stocked which is why we keep coming back. It’s so close to everything yet seems so far away from all the hustle and bustle of every day life. The view from the hot tub is beyond priceless! Thanks for sharing your beautiful home with us at a reasonable price! We are so glad we can come here year after year!